I saw a cool app-note from Maxim that described a gamma-photon detector which used a regular PIN-diode as a sensor. The actual circuit looked simple enough so I decided build it, you can never have too many measurement instruments right? The detector in itself is pretty simple, just some op-amps and a comparator. I decided to build it with all the bells and whistles so I included a digital potentiometer so you can adjust the reference voltage to the comparator via an SPI-bus. I also used a 5V reference shunt as the reference for the op-amps and the comparator to keep the circuits behaviour more consistent. I didn’t have any adjustable capacitors with an SPI bus so I decided against using one (instead of C4, changing the capacitance changes the gain). Basically the circuit works by amplifying the small current that is generated when a photon hits the PIN-diode. 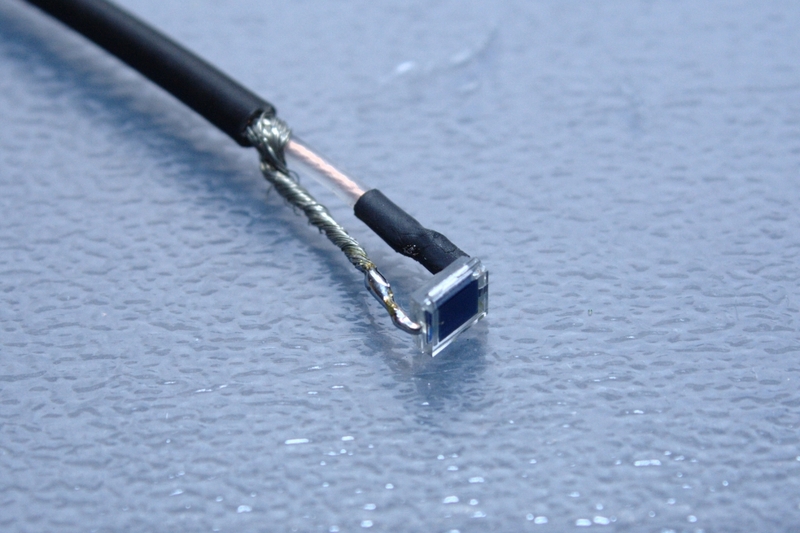 This includes visible light as well so you need to shield the PIN-diode from light. The signal is then amplified with four low-noise op-amps and then a comparator is used to distinguish the photon strikes. 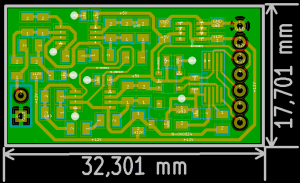 I sort of got carried away with the PCB design (like I usually do) and the layout ended up pretty compact and very neat (if I may say so!). Zero jump wires and a uniform ground plane. Passive components are 0805 (except 100n caps are 0603) and the op-amps are in a µmax-8 case and digital pot is µmax-10. Designed with kicad. 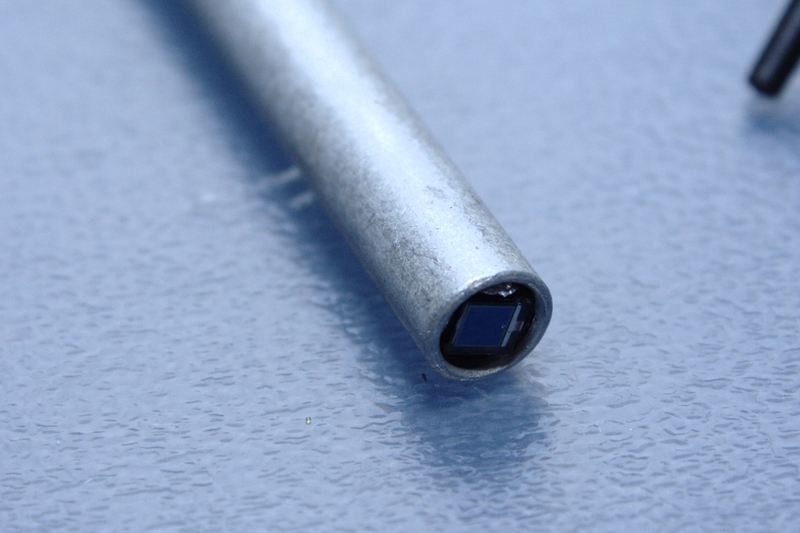 The PIN-diode is stuffed in with some aluminum foil to make sure the aluminum tube is grounded. There is a single layer of aluminum foil over the PIN-diode. I’m really enjoying looking at your projects. You obviously aare making your own PCBs. I’m curious what system you are using and whether you have any pro-tips for those of us just starting out with DIY PCBs. 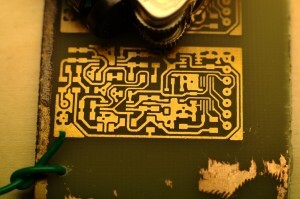 I’ve always just ordered my PCBs but now I need to make some as part of a workshop I’m running. Hello Simon! I nowadays make PCBs pretty rarely (main exception being RF PCBs with PTFE substrate) but when I do I have an extremely simple setup. I use photosensitive PCBs (either precoated or I coat them myself), expose them with a regular 11 W fluorescent desk light (works fine for small PCBs). The mask is a printed overhead projector transparency sheet and I use a thin glass from an Ikea photo frame as the weight. I then develop the PCBs in 1 % solution of NaOH (KOH works too, you can get both as drain cleaners) and etch the PCBs with sodium persulphate (less messy than ferric chloride) that I warm in a microwave oven in a tupperware container. Simple! Takes a bit of trial and error to get the exposure time and distance correct but after you get them right I have a very good success rate. 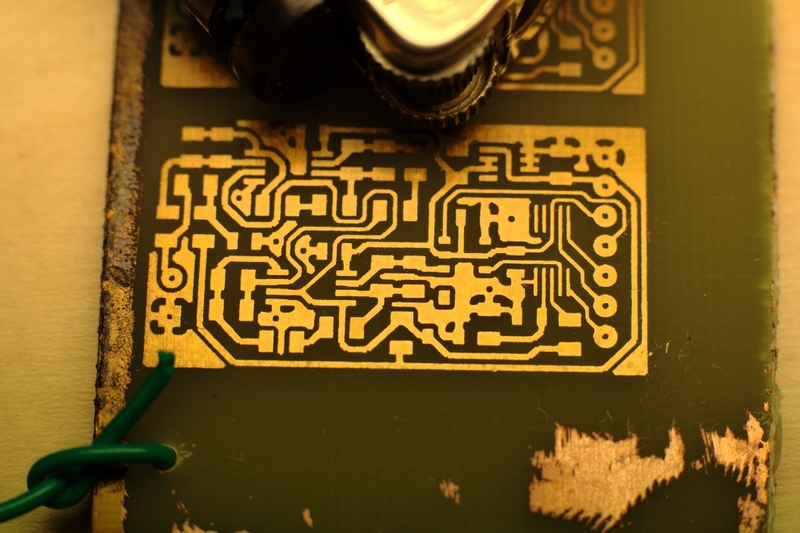 Only limitation is that when exposing with a regular desk lamp it starts to become difficult to expose PCBs of over 100x50mm or so evenly. it is possible to send me the *sch and *brd files from this Eagle project? …or any other CAD files for producing the PCB´s. Hello Patte! Unfortunately I’ve lost the files when my HDD failed. Do you know the sub-curcuit of the MAX4477 operational amplifier that is used in your schematic? Also, do you know the Spice engine? I’m trying to simulate the behaviour of a circuit like above without actually building it. The problem is simulating the op amp’s behaviour. Do you know how to write a model? You could check the manufacturers site if they have a model. Usually for simulations you do not care so much about the specific properties of the op-amp and just use an ideal op-amp or some other model that looks fairly equivalent. Making good models yourself is pretty difficult. Hi, thanks for sharing. I don’t understand how you want to register 60 keV gamma-ray and use BPW34. It says in the documentation that it is sensitive to 400-1000 nm wavelength which corresponds to 10’s of eV not keV. It should not be sensitive to keV. It usually needs a scintillator first that converts gamma-rays into light. What do you think of that? Scintillators are used for other purposes, such as higher sensitivity and very low energies where the particles might not have enough energy to penetrate the glass/shield of the sensor. Hi again, thanks for clarifying that. 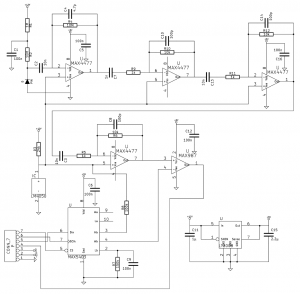 Is that the reason why you used so many op amplifiers in your schematic? How did you determine the amount of amlifiers needed and other electrical parameters like +12V voltage and capacitance of the amps? 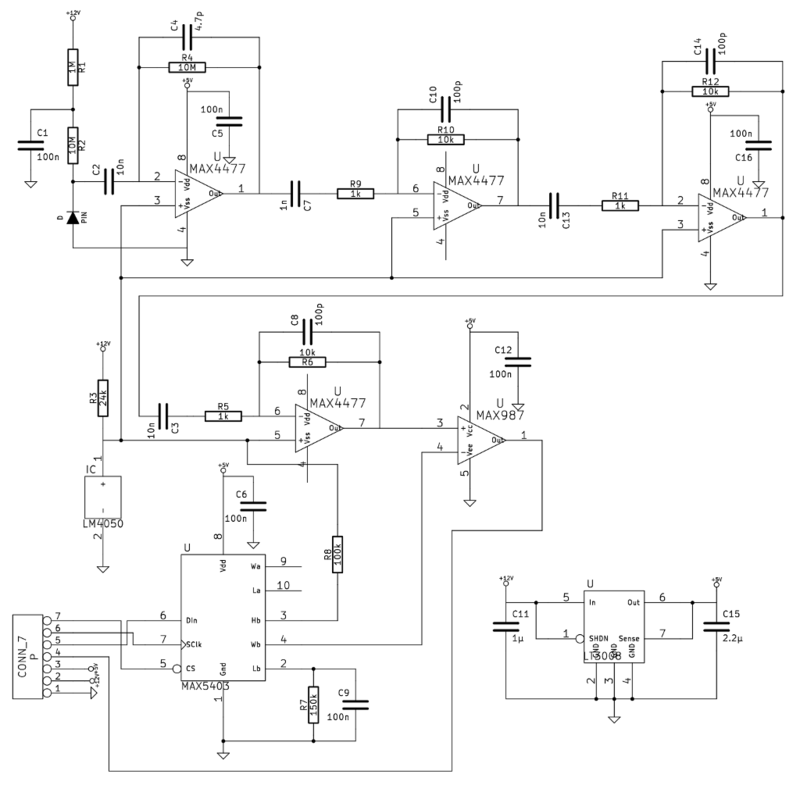 This circuit is based on Maxim app-note. The amount of amplifiers depends on the desired gain. A single amplifier with loads of gain is usually not a good choice because it can be very unstable so usually a chain of amplifier stages with less gain each are usually used. Hi, thanks for your help. I need to detect gamma radiation of 20 keV and above and i need to distinguish between 20 keV and 100 keV. In other words i need the output voltage to be proportional to the energy of a gamma quantum. So i need a sensitive detector. If i use this schematic would i be able to tell the difference? I see you use comparator in the end to distinguish between signal and noise. Is this a digital element i.e. the output is 0 if the signal is lower than detection level and 1 if it’s higher than detection level? I think i need analog output in the end to be able to calculate the energy of a photon. Thanks for helping, Ilya N.
Yes you can omit the comparator. Then you get downward pulses where the voltage of the pulse should correlate to the energy of the particle. Detecting such low energies can be problematic because 20 keV photons will be almost totally blocked by the glass over the sensor and pretty much anything. 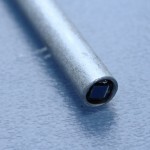 Is there a pin-diode without the glass to block the photons? Not really. For such low energies you would probably need to look in to some other methods of detection such as scintillators which have a beryllium window or something. 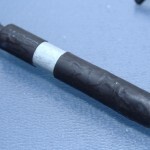 Do you know any cheap scinatillators or other cheap methods of detection? I’m low on funds xD. You might be able to find some cheap scintillators on eBay, otherwise I have no ideas. How thick is glass over the sensor in your case? Or do you have an aluminium window? I think if you have even 1mm of glass, 60 keV photons as in your case should not pass through. If you have only aluminium to block the photons then it’s going to pass through without a problem at 60 keV. I’m not sure how thick the window is. I would assume it’s “something in the range of” 0.1-0.2 mm. There is a piece of aluminum foil over it. There certainly weren’t many particles detected but you could detect it over the background. Can you send me the drawing of your circuit and the parts you used? I had so much noise in my circuit and I need to make a new one. 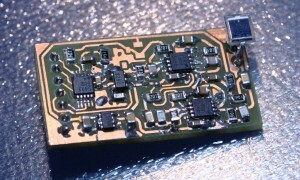 i’m reasearching for the radiantion detector circuit using the bpw34. However, i dont understand how to reckon the radiation doses by counting pulses which are born by the interaction between the radiantion and bpw34. For example, with GM- Tube SBM-20 we’ll have the dose = (conversion coefficient*pulses). Looking forwards to seeing your reply as soon as possible. Hey Giang! Interesting question, and I have to say I have no idea. I’d assume you would somehow need to figure out the conversion coefficient for the BPW34. Maybe be somehow comparing it to a calibrated/known meter. maybe it’s only can detect presence of radiation, i have seen some videos about this problem, but no have any video mention to display the dose @@ Have u ever seen? If the circuit is using a comparator in the end like mine (the MAX987) then it can only detect if a particle hit the sensor or not. But if you look at the signal before the comparator you can say something about the energy of the particle which you need for calculating the dose if I understand it correctly. it looks like a really nice project. As the application note from Maxim is fairly old, I was wondering if you stuck with the same components or are there options with lower noise nowadays? And would you mind telling us which PIN you used? Hey David! I think the PIN-diode I used was BPW34. I used the same components as mentioned on the Maxim appnote. I’m just wondering if you’ve noticed mechanical noise on your sensor? I’ve been designing a similar circuit from scratch for a few months now and it always seems that if you give the detector a light tap it will count like crazy. Can’t say I’ve noticed that! I’m scratching my head why that might be… maybe the glass (or some other material) in the sensor emits some photons due to mechanical stress and piezoelectric effect? That looks like an interesting product! Not that expensive either at 100e shipped. Will you be able to sell me PCB for your design? Not sure if there’s enough activity but it should emit a 0.16MeV gamma photon from the potassium-40 decay! Thats “many”and “photons”… n’s missing! Very nice project! 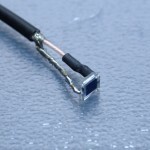 There is a japanese group selling a multi-photodiode circuit which works on the same principle and can be connected to an Iphone or Andorid phone. 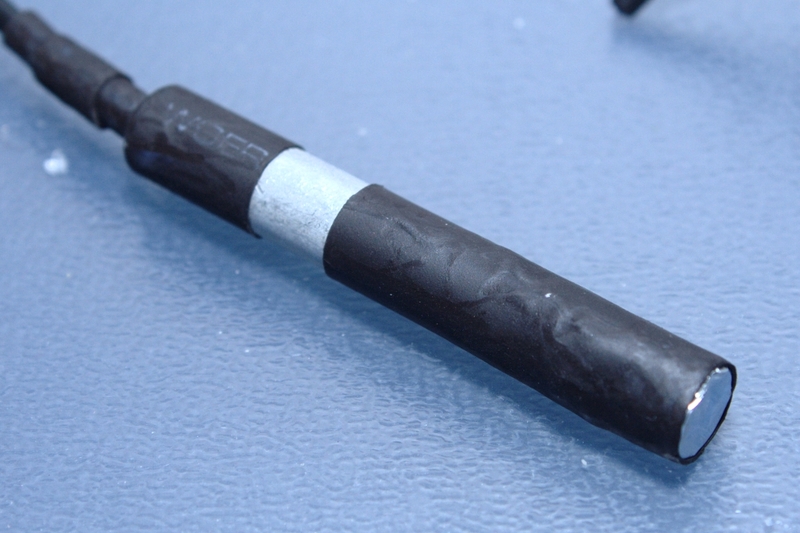 I would be interested in a setup like yours to build a very directional probe for radioactive mineral hunting. Also, it could be interesting to interface the photodiode signal with the PRA and Intune software and check out if there is any chance of analyzing the photon energy like with proper scintillators. Let me know if you need a piece of uranium mineral for some testing.. It might be possible to deduce photon energies from the strikes, I need to do some testing and see if they seem to correlate and how well. 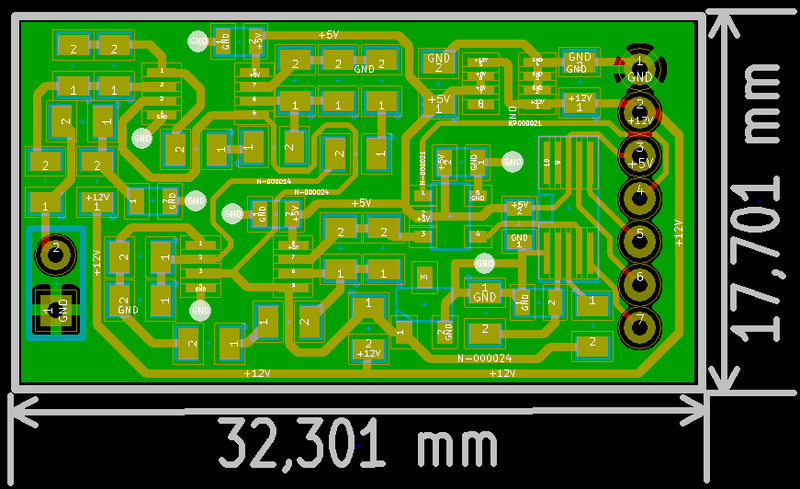 Some proper PIN-diodes with a large die-area would really bump up the sensitivity. Several PIN-diodes in parallel would most likely need separate op-amps. It appears that the noise on large surface PIN diodes builds up to an extent where it is equivalent to the 10 – 60 KeV of may gamma photos. The PRA software should handle that well. It basically does a FTT analysis and a statistical distribution of similar signals. Only takes a direct audio connection to a soundcard / computer. I shall look for a nice single or double peaked source forsome testing.